If you have Zika, follow these steps to protect others from getting sick. During the first week of infection, Zika virus can be found in the blood and passed from an infected person to another mosquito through mosquito bites. An infected mosquito can then spread the virus to other people. To help prevent others from getting sick, avoid mosquito bites during the first week of illness. The best way to reduce mosquitoes is to eliminate the places where the mosquito lays her eggs, like artificial containers that hold water in and around the home. In urban areas, Aedes mosquitos breed on water collections in artificial containers such as plastic cups, used tires, broken bottles, flower pots, etc (see also transmission of Zika virus). Periodic draining or removal of artificial containers is the most effective way of reducing the breeding grounds for mosquitos. Larvicide treatment is another effective way to control the vector larvae but the larvicide chosen should be long-lasting and preferably. There are some very effective insect growth regulators (IGRs) available which are both safe and long-lasting (e.g. pyriproxyfen). 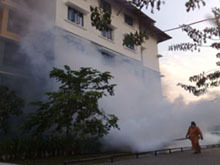 For reducing the adult mosquito load, fogging with insecticide is somewhat effective. Prevention of mosquito bites is another way of preventing Zika disease. The adult mosquitoes like to bite inside as well as around homes, during the day and at night when the lights are on. To protect yourself, use insect repellent on your skin while indoors or out, mosquito traps or mosquito nets. When used properly, repellents are safe for kids and adults alike. Keep in mind that even though some of them are classified as pesticides by the Environmental Protection Agency (EPA), repellents don't kill mosquitoes. So you may still see these annoying insects buzzing about. 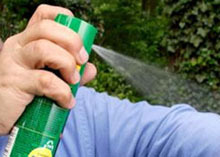 Repellents simply make it more difficult for mosquitoes to find you.